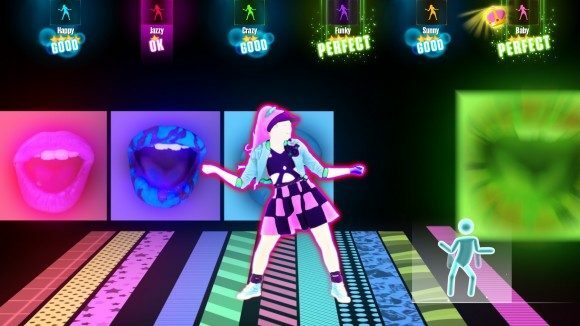 Fans of mass-marketed computerized music with more electronic beeps and autotuned singing than you can shake a stick at have reason to rejoice, as Ubisoft have just released Just Dance 2015. Just Dance 2015 is the sixth game in the very popular Just Dance series, which has sold over 50 million copies over its six year existence. Players gyrate to their favorite top 40 hits using their console’s motion detecting peripherals and earn points based on how well they mimic the on-screen dancer’s moves. This year’s iteration introduces a number of new features. One of them is the Community Remix mode in which players dance along to a song, with the screen occupied by video of other real-life players’ performances that they have recorded with their console’s camera. The developers then chop up a number of these videos into a remix that players dance along to. Another new feature is Dance VIP in which players dance along to footage of various dancers of some repute. These include professional choreographers, official dancers of the Just Dance series, and in a few cases the actual artist of the song being played. Over the past six years, Just Dance has become the best-selling music game franchise of all time with over 50 million units sold to date. This year with Just Dance 2015 we’re featuring more top Billboard artists than ever before and we’ve worked to develop new game features that bring the community – our fans – into the game in innovative and interactive ways. The tracklist of Just Dance 2015 consists of 43 songs from various performers including One Direction, Kate Perry, Rihanna, Will.i.am, Maroon 5, and of course everyone’s favorite pillar of moral behavior, Miley Cyrus. There’s also DLC readily available upon launch, which includes songs from Jennifer Lopez, LMFAO, another pillar of moral behavior, Justin Bieber, and yes, PSY of “Gangnam Style” fame. Just Dance 2015 is out for the PlayStation 3, PlayStation 4, Wii, Wii U, Xbox 360 and Xbox One in North America. The EU and UK versions will be released on the 23rd and 24th, respectively.